And yet another module aiming to make your life easier. Let’s say, you have a social network website developed on Drupal, or any other website, requiring communication between users. Naturally, you’d want to implement notifications service in addition to private messages feature. Would be cool, if users would be notified, who appeared online, who wrote the comment or message to them, right? We solved the problem, having made notifications functional and good looking! To make the communication on your website even more convenient, implement pop-up notifications just like in Facebook! The users of your website would surely be satisfied with that. We have developed a module to answer those and some other needs of yours. This module provides rules action for node.js notifications. You can apply this action to any rules event. You can set up subject and body with different text or pattern in nodejs action, then define which users can see this message. 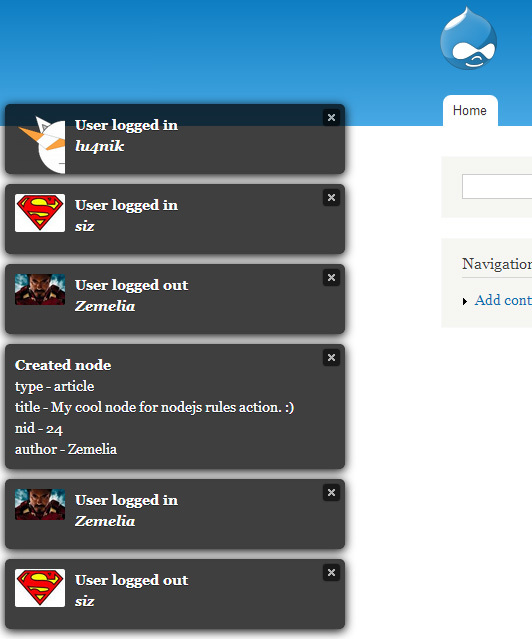 It can be multiple users roles or user`s IDs. User will be able to see message in the left-bottom corner of the page on the event.